Click tracking: when your recipients click a tracked link, they are very briefly brought to a URL with your domain, and then redirected to the link destination. Downloading a cloud-hosted attachment: when you send your recipient a cloud-hosted attachment and they download it from your email, a new tab briefly opens, from which they download their attachment. This tab will have your custom domain. Booking an event using Meeting Types: when you set up a Meeting Type, you get a designated URL from which your recipients can book time on your calendar. You can specify the domain for this custom URL. Adding your own custom domain enables you to have full branding control over all aspects of your recipients’ experience. 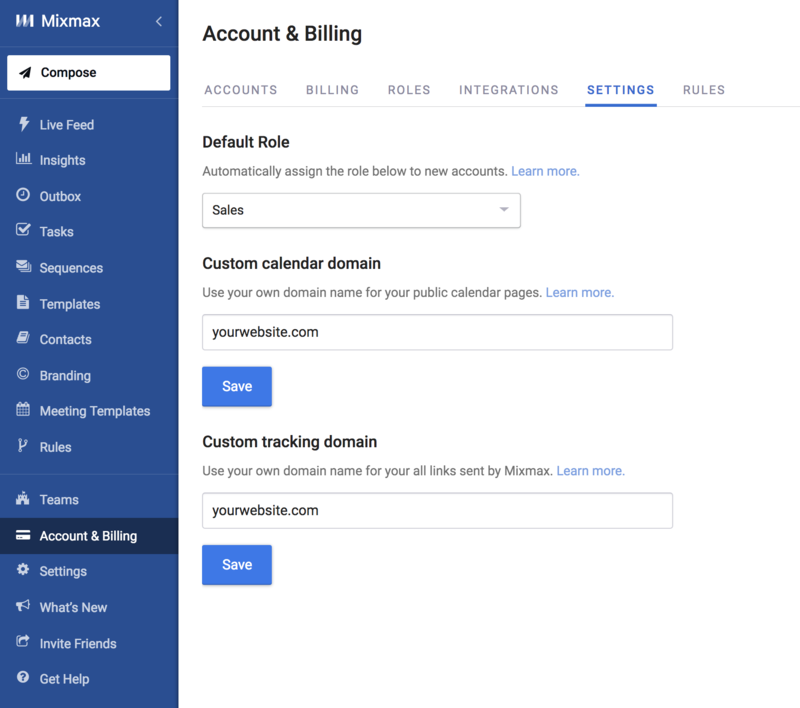 Organization administrators will go to their Account & Billing page. Click the Settings tab in the top menu. Here, enter your Custom calendar domain and/or Custom tracking domain. You may be wondering what custom domain to enter here. It’s really up to you! First, you should already have a purchased website domain. As an example, we’ll use yourwebsite.com. Next, you’ll add a subdomain of your choosing to the beginning. We suggest using “ calendar.” for custom calendar links and “tracking.” for custom tracking links. Continuing with our example, your custom domains would be calendar.yourwebsite.com and tracking.yourwebsite.com. You’d enter these values into the fields. Once you enter your custom domain and click “ Save”, we’ll provide you with the value to set as a CNAME for that domain. This value is where your CNAME will point to. The CNAME will highlighted in red. Go to your domain registrar, and create a CNAME record for your domain pointing to that value. Host Name: this is where to place the subdomain of your choosing. We suggest using “calendar.” for custom calendar links and “tracking.” for custom tracking links. If your DNS provider doesn’t call it “Host Name”, it may be called “Name”. You’ll see that other records include values like “www” or “@”here - that’s how you’ll know you’re in the right column. Address: insert the value Mixmax provides to you. This is where the subdomain will point to. If your DNS provider doesn’t call it “Address”, it may be called “Value”. Other records will include your website’s IP address, nameserver, or “@”. It can take up to a few hours for Mixmax to validate that you own the domain you’ve registered. It depends on how quickly your DNS registrar updates your DNS records. Once we’ve validated the domain, you’ll see a green checkmark next to it in your Settings and we’ll immediately begin to use it for all tracking and calendar links.